This simple dip recipe is so awesome that you will find yourself keeping a bowl stocked in your fridge at all times! It is great to enjoy bread with, it goes perfectly with crackers and even vegetables like carrots and celery sticks. Artichoke hearts, garlic and spinach - all finely chopped. Method: In a pan heat up olive oil, add garlic and artichoke. Fry till artichoke tuens brown on edges. Now add in the spinach. Transfer this mix to a baking dish. In the pan heat up butter and add flour. Add milk and heat till sauce thickens. This is a simple white sauce that you have probably made for Mac-n-cheese. Now add in the cream cheese (a lot) and other types of cheese you have. Transfer to the baking dish where spinch mix awaits. 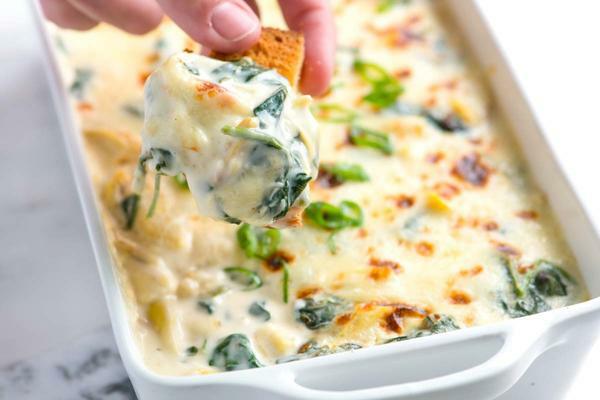 Mix everything up and bake for 10 minutes or till the dip turns bubbly. Enjoy with any type of bread or breadsticks. A Sandwich Even Your Toddler Will Love! Make Delicious Hot Medu Vada at Home! Easy Oreo Cake Your Kids Will Love! Do You Know How To Bake A Sponge Cake?